Gabon (; French pronunciation: ​), officially the Gabonese Republic (French: République gabonaise ), is a sovereign state on the west coast of Central Africa. Located on the equator, Gabon is bordered by Equatorial Guinea to the northwest, Cameroon to the north, the Republic of the Congo on the east and south, and the Gulf of Guinea to the west. It has an area of nearly 270,000 square kilometres (100,000 sq mi) and its population is estimated at 1.5 million people. Its capital and largest city is Libreville. Low population density, abundant petroleum, and foreign private investment have helped make Gabon one of the most prosperous countries in Sub-Saharan Africa, with the 4th highest HDI and the third highest GDP per capita (PPP) (after Equatorial Guinea and Botswana) in the region. 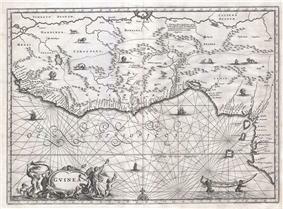 A map of West Africa in 1670. In the 15th century, the first Europeans arrived. The nation's present name originates from "Gabão", Franceville, and was later colonial governor. Several Bantu groups lived in the area that is now Gabon when France officially occupied it in 1885. Ghazvinian, John (2008). Untapped: The Scramble for Africa's Oil. Orlando: Harcourt. Petringa, Maria (2006). Brazza, A Life for Africa. Bloomington, IN: AuthorHouse. Rich, Jeremy (2007). A Workman Is Worthy of His Meat: Food and Colonialism in the Gabon Estuary. Lincoln: University of Nebraska Press. Shaxson, Nicholas (2007). Poisoned Wells: The Dirty Politics of African Oil. New York: Palgrave Macmillan. Warne, Sophie (2003). Bradt Travel Guide: Gabon and São Tomé and Príncipe. Guilford, CT: Chalfont St. Peter. Yates, Douglas A. (1996). The Rentier State in Africa: Oil Rent Dependency and Neo-colonialism in the Republic of Gabon. Trenton, NJ: Africa World Press. ^ a b c d "Gabon". International Monetary Fund. Retrieved 2014-04-20. ^ a b c "2014 Human Development Report Summary". United Nations Development Programme. 2014. pp. 21–25. Retrieved 27 July 2014. ^ a b c d e f g h i j k l m n o p q r s t u v w x y z aa ab ac ad ae Background note: Gabon. U.S. Department of State (August 4, 2010). This article incorporates text from this source, which is in the public domain. ^ a b Goma, Yves Laurent (2011-01-26). "Gabon opposition leader declares himself president". ^ Conrad Ouellon. "Le Gabon". Tlfq.ulaval.ca. Retrieved 2010-06-27. ^ Duval Smith, Alex (9 October 2012). "Frosty relations with Hollande see Gabon break the French connection". ^ "Gabon to introduce English as second official language". ^ a b c International Religious Freedom Report 2007: Gabon. United States Bureau of Democracy, Human Rights and Labor (September 14, 2007). This article incorporates text from this source, which is in the public domain. ^ "Gabon". 2005 Findings on the Worst Forms of Child Labor. Bureau of International Labor Affairs, U.S. Department of Labor (2006). This article incorporates text from this source, which is in the public domain. Education is compulsory for children ages 6 to 16 under the Education Act. Most children in Gabon start their school lives by attending Nurseries or "Crèche", then Kindergarten known as "Jardins d'Enfants". At age 6, they are enrolled in Primary School, "École Primaire" which is made up of six grades. The next level is "École Secondaire", which is made up of seven grades. The planned graduation age is 19 years old. Those who graduate can apply for admission at institutions of Higher learning, including engineering schools or business schools. Gabon's education system is regulated by two ministries: The Ministry of Education, in charge of pre-kindergarten through the last High School Grade, and the Ministry of Higher Education and Innovative Technologies, in charge of Universities and Higher Education and Professional Schools. The HIV/AIDS prevalence is estimated to be 5.2% of the adult population (ages 15–49). As of 2009, approximately 46,000 people were living with HIV/AIDS. There were an estimated 2,400 deaths from AIDS in 2009 – down from 3,000 deaths in 2003. In 2000, 70% of the population had access to safe drinking water and 21% had adequate sanitation. A comprehensive government health program treats such diseases as leprosy, sleeping sickness, malaria, filariasis, intestinal worms, and tuberculosis. Rates for immunization of children under the age of one were 97% for tuberculosis and 65% for polio. Immunization rates for DPT and measles were 37% and 56% respectively. Gabon has a domestic supply of pharmaceuticals from a large, modern factory in Libreville. Most of the health services of Gabon are public, but there are some private institutions, of which the best known is the hospital established in 1913 in Lambaréné by Albert Schweitzer. Gabon's medical infrastructure is considered one of the best in West Africa. By 1985 there were 28 hospitals, 87 medical centers, and 312 infirmaries and dispensaries. As of 2004, there were an estimated 29 physicians per 100,000 people. Approximately 90% of the population had access to health care services. L'Union in Libreville, the government-controlled daily newspaper, had an average daily circulation of 40,000 in 2002. The weekly Gabon d'Aujourdhui, is published by the Ministry of Communications. There are about nine privately owned periodicals which are either independent or affiliated with political parties. These publish in small numbers and are often delayed by financial constraints. The constitution of Gabon provides for free speech and a free press, and the government supports these rights. Several periodicals actively criticize the government and foreign publications are widely available. 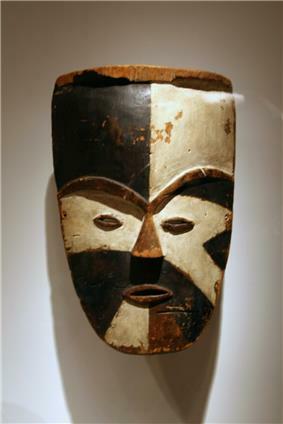 Gabon also features internationally celebrated masks, such as the n'goltang (Fang) and the relicary figures of the Kota. Each group has its own set of masks used for various reasons. They are mostly used in traditional ceremonies such as marriage, birth and funerals. Traditionalists mainly work with rare local woods and other precious materials. Gabonese music is lesser-known in comparison with regional giants like the La Rose Mbadou and Sylvain Avara, and the singer Oliver N'Goma. Imported rock and hip hop from the US and UK are popular in Gabon, as are rumba, makossa and soukous. Gabonese folk instruments include the obala, the ngombi, balafon and traditional drums. Major religions practiced in Gabon include Christianity (Roman Catholicism and Protestantism), Bwiti, Islam, and indigenous animistic religion. Many persons practice elements of both Christianity and traditional indigenous religious beliefs. Approximately 73 percent of the population, including noncitizens, practice at least some elements of Christianity, including the syncretistic Bwiti; 12 percent practice Islam (of whom 80 to 90 percent are foreigners); 10 percent practice traditional indigenous religious beliefs exclusively; and 5 percent practice no religion or are atheists. Gabon's literacy rate is 88.4%. Most ethnicities are spread throughout Gabon, leading to constant contact and interaction among the groups. Intermarriage between the ethnicities is quite common, helping reduce ethnic tensions. French, the language of its former colonial ruler, is a unifying force. The Democratic Party of Gabon (PDG)'s historical dominance also has served to unite various ethnicities and local interests into a larger whole. More than 10,000 native French live in Gabon, including an estimated 2,000 dual nationals. It is estimated that 80% of the country's population can speak French, and that 30% of Libreville residents are native speakers of the language. Nationally, 32% of the Gabonese people speak the Fang language as a mother tongue. Almost all Gabonese are of Bantu origin, though Gabon has at least forty ethnic groups with diverse languages and cultures. The Fang are generally thought to be the largest, although recent census data seem to favor the Nzebi. Others include the Myene, Kota, Shira, Puru, and Kande. Ethnic boundaries are less sharply drawn in Gabon than elsewhere in Africa. There are also various Pygmy peoples: the Bongo, Kota, and Baka; the latter speak the only non-Bantu language in Gabon. 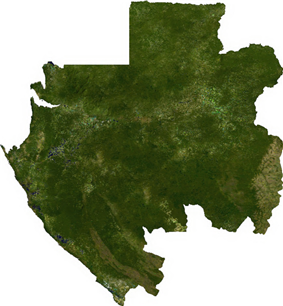 Gabon has a population that is estimated at 1,545,255. Historical and environmental factors caused Gabon's population to decline between 1900 and 1940. It has one of the lowest population densities of any country in Africa, and the fourth highest Human Development Index in Sub-Saharan Africa. Many foreign and local observers have consistently lamented the lack of diversity in the Gabonese economy. Various factors have so far stymied additional industries—a small market of about 1 million people, dependence on French imports, inability to capitalize on regional markets, lack of entrepreneurial zeal among the Gabonese, and the fairly regular stream of oil "rent". Further investment in agricultural or tourism sectors is complicated by poor infrastructure. The small processing and service sectors that do exist are largely dominated by a few prominent local investors. Gabon's oil revenues have given it a strong per capita GDP of $8,600, extremely high for the region. However the income distribution is skewed and social indicators show poor values. The richest 20% of the population earn over 90% of the income while about a third of the Gabonese population lives in poverty. Graphical depiction of Gabon's export products, in 28 color-coded categories. Gabon earned a poor reputation with the Paris Club and the International Monetary Fund (IMF) over the management of its debt and revenues. Successive IMF missions have criticized the government for overspending on off-budget items (in good years and bad), over-borrowing from the Central Bank, and slipping on the schedule for privatization and administrative reform. However, in September 2005, Gabon successfully concluded a 15-month Stand-By Arrangement with the IMF. Another 3-year Stand-By Arrangement with the IMF was approved in May 2007. Because of the financial crisis and social developments surrounding the death of President Omar Bongo and the elections, Gabon was unable to meet its economic goals under the Stand-By Arrangement in 2009. Negotiations with the IMF are ongoing. Gabonese public expenditures from the years of significant oil revenues were not spent efficiently. Overspending on the Transgabonais railroad, the oil price shock of 1986, the CFA franc devaluation of 1994, and low oil prices in the late 1990s caused serious debt problems that still plague the country. Gabon's economy is dominated by oil. 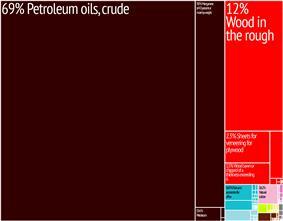 Oil revenues comprise roughly 46% of the government's budget, 43% of gross domestic product (GDP), and 81% of exports. Oil production is now declining rapidly from its high point of 370,000 barrels per day in 1997. Some estimates suggest that Gabonese oil will be expended by 2025. In spite of the decreasing oil revenues, planning is only now beginning for an after-oil scenario. The Grondin Oil Field was discovered in 50 m water depths 40 km offshore, in 1971 and produces from the Batanga sandstones of Maastrichtian age forming an anticline salt structural trap which is about 2 km deep. Natural resources include: petroleum, magnesium, iron, gold, uranium, and forests. 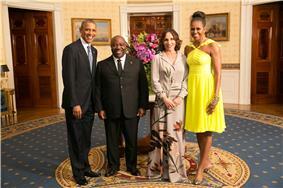 Gabon is also noted for efforts to preserve the natural environment. In 2002, President Omar Bongo Ondimba put Gabon firmly on the map as an important future ecotourism destination by designating roughly 10% of the nation's territory to be part of its national park system (with 13 parks in total), one of the largest proportions of nature parkland in the world. The National Agency for National Parks manages Gabon's national park system. Gabon's largest river is the Ogooué which is 1200 km long. Gabon has three karst areas where there are hundreds of caves located in the dolomite and limestone rocks. Some of the caves include Grotte du Lastoursville, Grotte du Lebamba, Grotte du Bongolo, and Grotte du Kessipougou. Many caves have not been explored yet. A National Geographic Expedition visited the caves in the summer of 2008 to document them (Expedition Website). Gabon is divided into nine provinces and further divided into 37 departments. Gabon is a member of the United Nations Security Council for January 2010 through December 2011 and held the rotating presidency in March 2010. In December 1999, through the mediation efforts of President Bongo, a peace accord was signed in the Republic of the Congo (Brazzaville) between the government and most leaders of an armed rebellion. President Bongo was also involved in the continuing D.R.C. peace process, and played a role in mediating the crisis in Côte d'Ivoire. Gabonese armed forces were also an integral part of the Central African Economic and Monetary Community (CEMAC) mission to the Central African Republic. Since independence, Gabon has followed a nonaligned policy, advocating dialogue in international affairs and recognizing each side of divided countries. In inter-African affairs, Gabon espouses development by evolution rather than revolution and favors regulated free enterprise as the system most likely to promote rapid economic growth. Gabon played an important leadership role in the stability of Central Africa through involvement in mediation efforts in Chad, the Central African Republic, Angola, the Republic of the Congo, the Democratic Republic of the Congo (D.R.C. ), and Burundi. Gabon has a small, professional military of about 5,000 personnel, divided into army, navy, air force, gendarmerie, and national police. Gabonese forces are oriented to the defense of the country and have not been trained for an offensive role. A 1,800-member guard provides security for the president. In provisional results, the ruling Gabonese Democratic Party (PDG) won 84 out of 120 parliamentary seats. For administrative purposes, Gabon is divided into nine provinces, which are further divided into 36 prefectures and eight separate subprefectures. The president appoints the provincial governors, the prefects, and the subprefects. In 1990, the government made major changes to Gabon's political system. A transitional constitution was drafted in May 1990 as an outgrowth of the national political conference in March–April and later revised by a constitutional committee. Among its provisions were a Western-style bill of rights, creation of a National Council of Democracy to oversee the guarantee of those rights, a governmental advisory board on economic and social issues, and an independent judiciary. After approval by the National Assembly, the PDG Central Committee, and the President, the Assembly unanimously adopted the constitution in March 1991. Multiparty legislative elections were held in 1990–91, despite the fact that opposition parties had not been declared formally legal. In spite of this, the elections produced the first representative, multiparty National Assembly. In January 1991, the Assembly passed by unanimous vote a law governing the legalization of opposition parties. The country has a bicameral legislature with a National Assembly and Senate. The National Assembly has 120 deputies who are popularly elected for a 5-year term. The Senate is composed of 102 members who are elected by municipal councils and regional assemblies and serve for 6 years. The Senate was created in the 1990–1991 constitutional revision, although it was not brought into being until after the 1997 local elections. The President of the Senate is next in succession to the President. Ali Bongo Ondimba, President of the Gabonese Republic, his wife Sylvia Bongo Ondimba, US president Barack Obama and his wife Michelle Obama in 2014. Facing a divided opposition, President Omar Bongo coasted to easy re-election in December 1998, with large majorities of the vote. While Bongo's major opponents rejected the outcome as fraudulent, some international observers characterized the results as representative despite many perceived irregularities, and there were none of the civil disturbances that followed the 1993 election. Peaceful though flawed legislative elections held in 2001–2002, which were boycotted by a number of smaller opposition parties and were widely criticized for their administrative weaknesses, produced a National Assembly almost completely dominated by the PDG and allied independents. In November 2005, President Omar Bongo was elected for his sixth term. He won re-election easily, but opponents claim that the balloting process was marred by irregularities. There were some instances of violence following the announcement of Omar Bongo's win, but Gabon generally remained peaceful. Following President Omar Bongo's re-election in December 1993 with 51% of the vote, opposition candidates refused to validate the election results. Serious civil disturbances led to an agreement between the government and opposition factions to work toward a political settlement. These talks led to the Paris Accords in November 1994, under which several opposition figures were included in a government of national unity. This arrangement soon broke down, however, and the 1996 and 1997 legislative and municipal elections provided the background for renewed partisan politics. The PDG won a landslide victory in the legislative election, but several major cities, including Libreville, elected opposition mayors during the 1997 local election.